Race Hard : Chiswick Regatta 2013 – Final! I forgot to mention in my brief post – post-heat – that after our long and strenuous row up to the start line – (yep, nothing better than an 8km row to warm up prior to an 800m race!) as we turned and got into position to race against Putney Town and Sons of the Thames, the heavens decided to open up! Huge black clouds surrounded us, and just as the marshalls called ‘Ready’, we were flooded! It didn’t stop us though, and we got our game-faces on, and got on with the job in hand! I took my phone out in the boat with me – in a neat little waterproof case of course, as we have a habit of getting soaked in races, with far too much backsplash going on! – and recorded the heat using GPS and SportsTracker. As the marshall shouted ‘Attention’, we buried our blades and got into it. With my eyes still in the boat, I could see the nearest boat – Son of the Thames – appearing to move off quicker than us, and getting a good half a boat-length ahead of us. However I could also see the third boat disappearing into the distance as we lengthened out our strokes and got the power down in the boat. Given the slow start, we soon picked up the pace and caught up with Sons of the Thames, to overtake them, and win the heat by half a boat length. We were all unsure on whether or not we made it in time till we got back onto land – but from what I could see in the corner of my eye, I was pretty sure we’d got to the line just before them! We were also rather surprised at the result of the heat before ours – Lea had been knocked out, along with Putney Town’s other team to race against Tyrian in the final. … which had been drying out on the riggers post-heat! We’d had a good crew chat, in prep for the race, and we were all very excited about it! The weather had changed – the clouds had moved on and the sun was now out – the water was still and low, and gone were the wind and waves. Once again we lined up against the competition – Tyrian – and waited for the marshall to call it. As with the heat, we appeared to lose ground on the start. Although we were much more in time, and the start felt good, Tyrian still shot off quicker than we did. According to Ted, we were a length behind at one point, however as we dug in and lengthened out the strokes we came through and pulled past Tyrian. We finished the race a boat length ahead – in fact the race was won almost a hundred metres from the final, with Tyrian slumped over their blades and looking like they’d been beaten before it was even over! Although our starts may not be the best – and bearing in mind this was still only the second time we’d rowed together as a crew, having had subs on outings before – our power and strength in the water was definitely our strength, and the psychological ‘warfare’ we had over the other crew made a huge difference. During our crew chat, pre-final, we had all discussed how much we wanted those pewter tankards, and our cox Clare decided she would use that to motivate us and keep us going strong! ‘Tankards for Ten’ was what she called out, instead of the usual ‘Legs for ten’, and it certainly did the trick! Left to right : myself, Belinda, Holly, Kathrin, Laura, Clare (cox), Skye, Hannah and Marketa. Looking very pleased with ourselves, with our tankards at Quintin Boat Club! As with the heat, I used my phone to track the race – the details of which can be found here on SportsTracker. 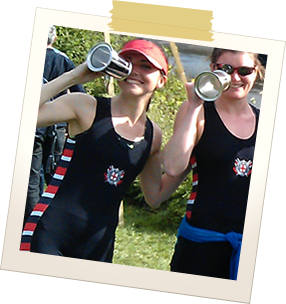 So, we’re now no longer Novices at TRC – having popped our rowing cherries! – we now move on to racing in the IM3 category – very exciting, given the short rowing experience we have had so far!